In order to use procedural refinement Houdini Engine version 16.0.600 or higher must be installed on your computer. You can download and install it by clicking here. Please note, that trial version does not allow to use Houdini assets in the Landscape Tool. Windows: After installing Houdini you should add Houdini binary location to the PATH environment variable. Linux: After installing Houdini you should add location of the libHAPIL.so (e.g., /opt/hfs16.0/dsolib) to the LD_LIBRARY_PATH environment variable. A procedural data source is assigned with a Houdini digital asset (*.hda file) and can be used to refine data from elevation and landcover data sources. It can also be used to refine the data produced by another procedural data source. The area for which refinement is to be performed is determined by an adjustable bounding rectangle, which can be manually placed inside the Play Area on the Preview panel. Due to the equirectangular projection, it looks like a trapezium near the terrestrial poles. Basic workflow (described below): you have a Houdini digital asset (a set of assets) that performs all necessary data refinement. Custom workflow: there is no Houdini digital asset available to perform necessary refinement. In this case you have to create a new houdini digital asset. The basic workflow is as follows (assuming necessary elevation and landcover data sources are added, see Specifying Data Sources section). In the Sources panel, add a procedural data source. Select a procedural data source you added in the Data Sources panel and adjust its bounding rectangle on the Preview panel (to indicate the area, for procedural refinement). If the bounding rectangle of a procedural data source is larger than the Play Area specified, procedural refinement calculations will be performed for this larger area. This may significantly increase generation time. Specify the following data source parameters in the Parameters panel. The density of the procedural data source, in meters per pixel. A procedural data source grabs the data for the Houdini asset from underlying data sources with the set density value (upsampling is performed if necessary). The path to the Houdini digital asset (*.hda file) that performs data refinement. Priority of the data source in the whole generation process. For more information see the Processing Priority section. The list of parameters required by the selected Houdini digital asset (if any). These parameters are specified when the digital asset is created and are used to pass certain numerical values or tags from the Landscape Tool to configure refinement procedure (e.g. 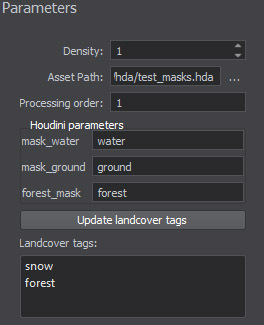 you can specify landcover tags to be treated by the Houdini asset as rivers for elevation adjustment). Currently supported types include float, integer, dropdown list. The list of tags of all underlying landcover data sources. If the bounding rectangle of the procedural data source covers (completely or partially) a landcover data source, all tags of the latter will be added to this list. A Houdini asset can generate its own landcover tags on the basis of input data. To add these tags to the list of available landcover tags use Update landcover tags button. You can add as many procedural data sources as necessary.